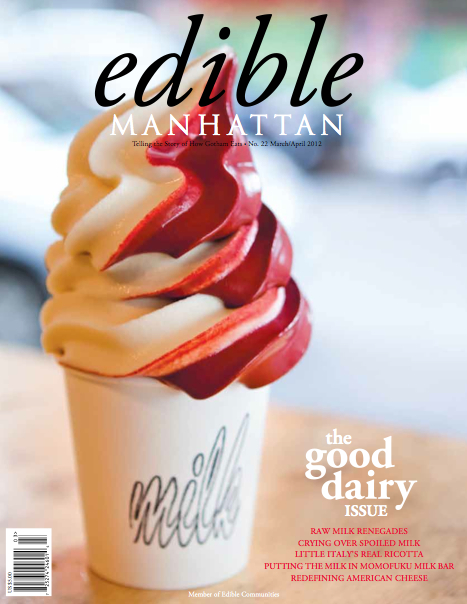 I always love coming across a copy of Edible Manhattan so I was thrilled when they asked me to contribute two pieces to their first ever dairy issue (March/April 2012). Tasked with finding the city’s best tres leches, all signs pointed to Daisy Lebron at Bizcocho de Colores in Upper Manhattan. On what seemed like the only cold day this past winter, I made the treck to the opposite side of the island and was rewarded with an amazing tres leches (or two). It was a treasure in a plastic clam shell. Click here to read Uptown, a Dominican Confection Makes Life Three Times Sweeter which includes an extended photo gallery by Elizabeth Leitzell. I also spent a few days navigating the fresh cheese cases for No Passport Needed: In the Supermarket Case, Queso. Also included in this issue, a great profile on everyone’s fantasy cheese shop Murray’s Cheese, the suprisingly local Greek yogurt, and the end of Milk Thistle which I didn’t quite believe until I went by the farmer’s market this Sunday and passed the empty spot where they should have been.